This is a continuation on the Op Ed pieces from BoomBustBlog readers. Enjoy! As can be seen from the data, we have seen a level of synchronicity that is completely unprecedented. And these bubbles were bigger than anything we had seen in our history. 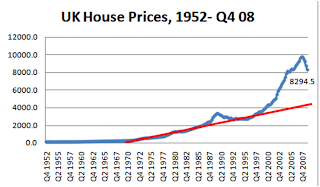 One pile of the mountain of global debt, then, was created out of the mistaken perception that this global house price bubble was real. It was not, but we are still left with the debt. No picture is fully crystal clear, but it is becoming clearer and clearer by the day that this is worse than 1929, and probably worse than 1893 and 1873. This was a full fledged global debt-fueled debt, housing and consumption bubble. 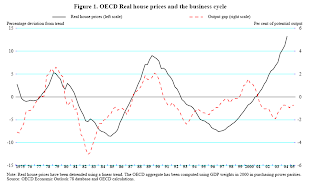 This is a chart of housing price deviation from "trend" (real prices, linear trend) for the GDP-weighted index of *all* OECD countries through 2005 (source). Updating the % deviation chart. 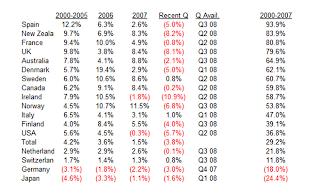 As noted in the table, the GDP-weighted increase in prices in 2006 and 2007 for the whole OECD were 3.6% and 1.5%. This takes our deviation from trend to approximately 20% on the 1st chart. Our peak is unprecedented. The prior peaks were 5% and 10% in 1978 and 1990, versus our current 20%. OECD countries that had housing bubbles - US, France, Italy, UK, Canada, Australia, Denmark, Finland, Ireland, Netherlands, Norway, New Zealand, Spain, Sweden. 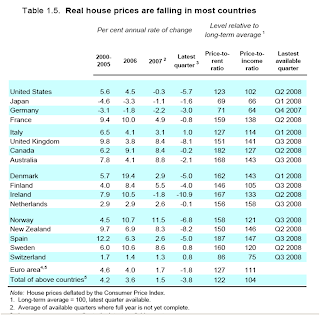 OECD countries that did not have housing bubbles - Japan, Germany, Switzerland. We know how bad our bubble was, but we were outdone by Finland, Italy, Norway, Ireland, Canada, Sweden, Denmark, Australia, the UK, France, New Zealand and (most of all) France. Again, only Switzerland (a bit) and Germany / Japan did not have housing bubbles. Who else definitely had bubbles? There are other articles which make it very clear that we had a really insane housing bubble in China (source, source, source, source). Chinese officials have even said they think housing is overvalued, and wanted to institute a mandatory 50% downpayment (!). They had a huge stock market bubble (source). At the same time, Chinese citizens believed buying a house was a riskless investment. They show all the markings of a populus that is going through their first real speculative bubble. Vietnam also had a property bubble. I have a friend who works for another hedge fund who said that at one point, housing prices in Saigon were higher than in Manhattan (when Manhattan prices were still really high). Articles support this (source). By August 2008, prices were down by up to 70% (source). 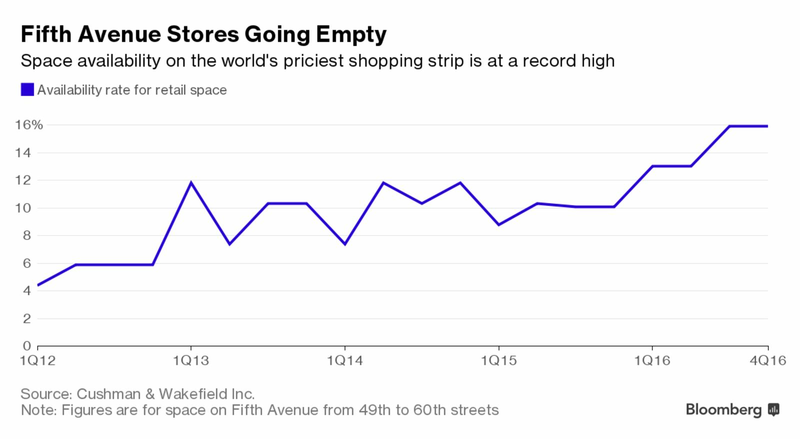 Looks like India had a bubble too (source, source), especially in metropolitan areas like Mumbai, Delhi and Chennai. Their prices apparently moved to levels seen in cities like London. They say that they are moving to parity, closing a gap that previously should not have existed. Perhaps it was the other way around. The ICIC is now saying prices *need to* fall by 20% or more (source). “It is a frightening picture,” Polonsky wrote. " 'Prices inside the Garden Ring (Moscow's central ring-road) could fall by several times,' said Aven, the 53-year-old president of Alfa Bank, Russia's largest private bank. Moscow was ranked as the world's most expensive city on earth for expatriates in July, in a survey of living costs in 143 cities. The Moscow property market has attracted large numbers of investors who have ratcheted up prices to levels far above what most Russians earn in a lifetime. " Housing - Much Much Paper Appreciation? In total, the data below implies we saw approximately $50T of paper asset appreciation in housing from 1999-2007. This is a larger amount of asset appreciation than we had during the global stock market bubble, or the stock market run-up prior to the Great Depression. It is completely unprecedented. This was a global phenomenon. 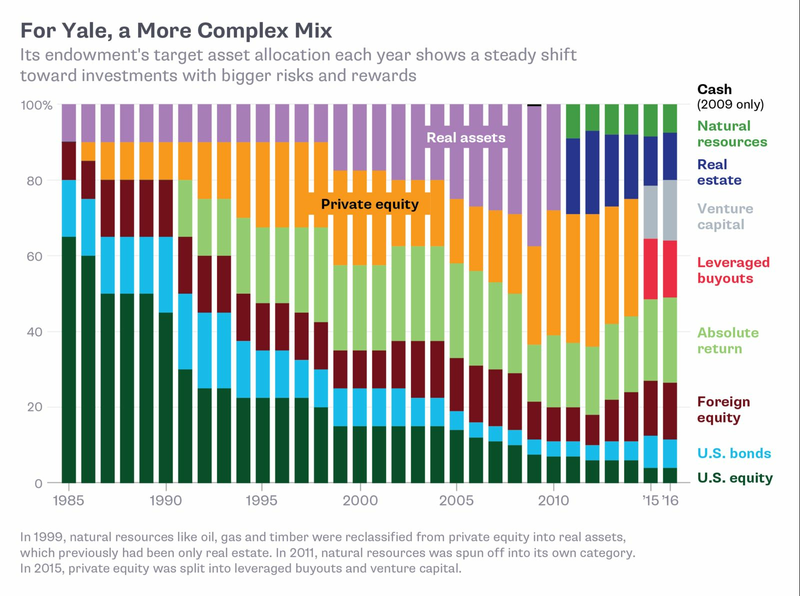 The debt fueled the asset price appreciation. Now the prices are moving back down, leaving us with (1) a record amount of debt ; (2) a record amount of current consumption coming purely from debt. 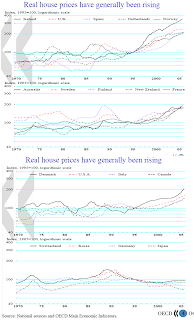 Total residential property values in developed world. By the end of 2004, total residential property in developed economies had increased in value by $30T over the prior 5 years to $70T (! ), or 100%+ of those countries' GDP's. 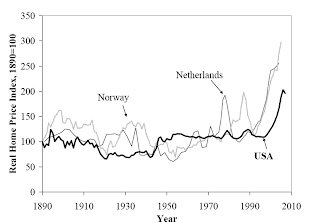 Increase in value as % of GDP is unprecedented. This increase in value is greater than the global stock market bubble (80% of GDP in developed economies over 5 years), or America's stock market bubble in the 1920's (55% of GDP). Increase was bigger than Japan's. The increase in home prices in Japan in the decade preceding 1991 was SMALLER than the home price increases of developed economies in the 10 years prior to 2004 (!). I had a few other notes to add as an addendum. 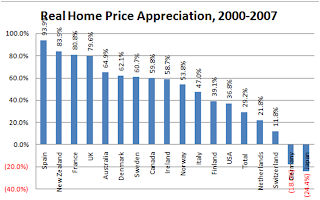 (1) Adjusting developed economy home value increase to 2007 - $42T of "appreciation"
Their figures run through to 2004. We have the real figures to update to 2007 (source). Global inflation in 2005, 2006 and 2007 was 2.7%, 2.5% and 2.2% (source). 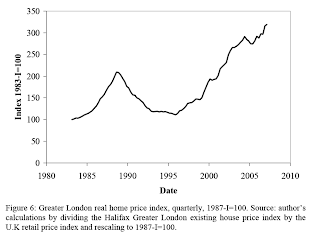 Putting it all together, we saw an 18% increase in home prices in 2005-2007 in developed economies. This adds $12T to the tally of "value" creation. $82T of adjusted residential value. A 30% haircut to this (conservative) implies $25T of asset value lost. As noted earlier, some of the most tremendous growth has been in the emerging economies - China, India, Russia, Vietnam, East Europe, and the Baltics. These are completely unaccounted for. If all these countries combined are 25% of the developed world, that would imply total residential value of $21T. $21T + $82T = $103T. Perhaps their paper asset appreciation was $5T?